The thread that ties together all types of passes is crafting good passes that make the receiver, the passer’s teammate, look first rate. This threat then ties the team together. Mark off a grid in the shape of a square or rectangle. The dimensions will vary depending upon the age group involved in the activity. Every player has a ball and lines up on one end of the grid. Each player makes a pass so that the ball stops as close as possible to the opposite line without going over the cliff. Players can pass all at once or take turns. Depending upon the distance between the end lines the activity can be used to teach long or short push pass technique. If the grid is small then toe or heel passes can be made. The training area dimensions can vary from 35 x 25 yards to 60 x 40 yards depending upon the age group. Use two age group regulation goals on each goal line. In the activity are two goalkeepers (yellow), two wingers (white), two defenders (blue) and three attackers (red). Flank zones (dark grey area in the diagram) should be marked off with flat or disc cones. Only the wingers play in the flank zones and they are confined to it. The defenders and attackers play in the middle zone (white in the diagram) and they are confined to that space. Each time a goalkeeper has possession of the ball he should distribute (1) to either of the wingers. The winger in possession of the ball dribbles (2) towards the opposite goal and crosses (3) the ball to the attackers. The goalkeeper and defender contest the attackers for the ball. The attackers try to win the cross and score (4) from a header, volley, half- volley or shot from the ground. The attackers could also set up shots from a knock-off. The defenders stay in their half of the field. The attackers go end to end as do the wingers. After two to five minutes have the field players switch roles. Play to ten goals scored. Play 2v2 up to 4v4 inside a grid with four goals on the outside. The grid should be rectangular in shape with dimensions of 15 x 20 or 25 x 40 dependent upon the age and/or number of players involved. 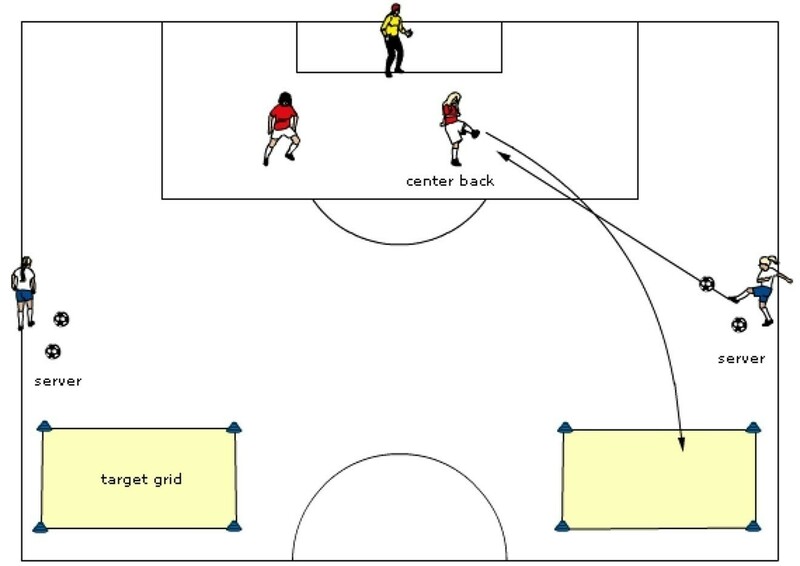 A goal is scored with a pass or shot from inside the grid on the goal outside. This activity allows for the possibility of instep pass, bent pass, chip pass and/or flick pass. The technique for passing with the inside of the foot and the instep on the half-volley and the full volley are essentially the same as when the ball is on the ground. The main difference is getting the kicking foot level with the ball to try and strike it through line A. This requires the passer to wait for the ball to have just bounced from the ground for the half-volley or to let the ball drop below knee height for the full volley. To strike the ball sooner the foot needs to be raised to the ball and sometimes this requires a jump. Other minor differences are the same for both parts of the foot, instep and inside, and are noted below. Make the clearance pass with the leg closest to the touchline where the ball will be redirected. The target grids should be in the flank channels 5-10 yards in from the touchline. The distance of the target grids from the goal line will vary according to the age group. The grids should get increasingly further away with each progressive age group. A player can make a longer clearance of the ball with the foot than the head. When making a clearance with the foot the inside of the foot should be used the majority of the time. 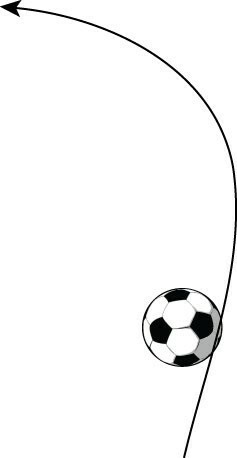 Occasionally the instep can be used, but beware that the ball can ‘roll’ off the top of the foot in this maneuver and go backwards toward the defender’s goal. All clearances should be high, wide and long. Play in one half of an age appropriate field. 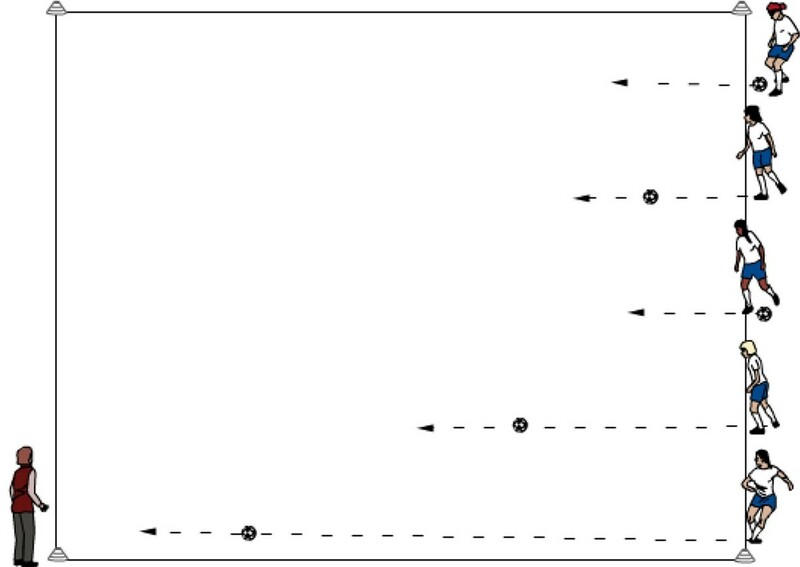 Mark off two target grids as noted by the shaded areas in the diagram. Place one server on each touchline with a supply of soccer balls. Put two center backs in the penalty area and a goalkeeper. The servers play a pass on the ground or in the air to the center back who clears the ball on the first touch to the target area. The goalkeeper should collect any ball missed by either center back. The center back makes a decision to clear the ball with the foot or head depending on the service of the ball. Servers and center backs can play simultaneously or take turns. Center backs should switch sides after eight repetitions in order to practice clearances with either foot. One set is eight repetitions on each side for a total of sixteen repetitions.